Sanitaire ST synthetic dust bags expand as they fill. Air flows through efficiently, while keeping dust and allergens inside the bag. 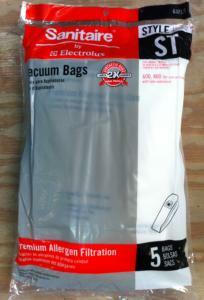 The unique construction allows the vacuum to maintain maximum suction until the bag is almost filled. These superior features allow the Sanitaire ST synthetic bags to last nearly twice as long as traditional bags. These are 5 of the best quality bags on the market for the Sanitaire 600, and 800 Series Uprights (or other models with a tube extension). These Premium Allergen, HEPA Type Synthetic Cloth Bags are designed to capture a much smaller particle then standard paper bags do. These bags also help control odors, and reduce airborne allergens, by keeping more particles inside the bag. Also highly recommended when vacuuming cement debris, or other fine powders which tend to clog, and ultimately burst paper bags.